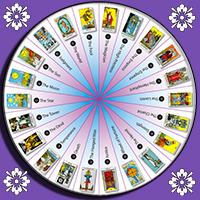 The Tarot itself is divided into two specific sections: The Major Arcana and the Minor Arcana. The Minor Arcana is made up of four suits. These suits may vary, as there are many variations of Tarot decks, but typically they are swords, pentacles, cups, and wands (or staves). Each suit numbers 1 through 10, and also include a King, Queen, Knight and a Page. Again, some of these names might vary from deck to deck. The Major Arcana is made up of 21 additional cards, each card depicting a figure, figures, or a symbol. These include The Sun, The Hanged Man, The Hermit, The Empress, The Lovers, and The Wheel of Fortune, to name a few. The most popular and well known of the many varieties of Tarot decks is the “Rider” deck, created by A. E. Waite, a member of the Hermetic Order of the Golden Dawn. This order was comprised of magicians who believed that the cards of the Major Arcana symbolized pathways into the mind, related to the tree of life. Using the Tarot cards as a means of divination has become somewhat of a standard practice amongst would-be “psychics”, somewhat diminishing the seriousness of the practice. 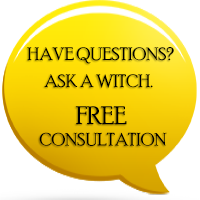 In fact, Tarot readings have become an opportunistic business throughout the nation. However, only a practiced individual with years of experience and an innate talent for mastery of the Tarot can truly understand and accurately interpret the cards drawn for any particular reading. Because each card drawn is relative to one another, and all the cards drawn are relative to the individual who has drawn them, each reading is unique. 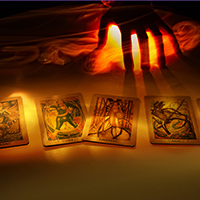 Divining the meanings of the cards is an ancient tradition, and a professional Tarot reading should never be considered lightly. I would really like to know if I'm going to come into money any time soon.and what happen to my daughter Tiffany,and her kids.and how did this guy turn everything around on me.and are they OK.And dose my oldest daughter Rita have anything to do with what's going on with Tiffany. I would really like to know if I'm going to come into money any time soon.and what happen to my daughter Tiffany,and her kids.and how did this guy turn everything around on me.and are they OK.And dose my oldest daughter Rita have anything to do with what's going on with Tiffany. I wish I could change everything back the way it was now.And put this guy and his parents and anyone else invalid in jail for a long time urgently fast.And make everything go my way for ever.and become very luckie at everything.and make all those people who had anything to do with all this crazy stuff have extreamly bad luck at everything for life because it hurts bad.I wish I could become very rich,powerful,strong,and me and my husband could have the best life ever and every protected for life.And no one could ever hurt us again.and I wish I could lose about 40 pounds now.and was very well liked and respected by all.